White Collar Crime in Georgia--A Blog By The Goolsby Law Firm, LLC. (706) 863-5281: A New Melissa McCarthy Movie About Identity Theft! A New Melissa McCarthy Movie About Identity Theft! Look, just because we are Augusta, Georgia criminal lawyers, and just because I am a former federal prosecutor, it doesn't mean that we don't like to get out sometimes and have some fun, too! And if the fun somehow relates to our work, then that is fine, too! 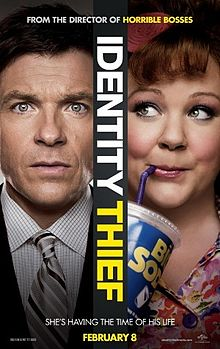 I plan to have fun on February 8th by attending the premiere of the new comedy movie Identity Thief. The movie stars actors Jason Bateman and Molly McCarthy. I am a big fan of both of these actors, especially Ms. McCarthy. You will recall that Ms. McCarthy, who currently stars in the t.v. series Mike & Molly, stole the show in the movie Bridesmaids. According to previews, in this new flick, Ms. McCarthy's character steals the identity of Bateman's character and he is out to get her! Although identity theft -- which is one of the fastest growing crimes in the United States -- is no laughing matter, here's hoping that this new movie about this nefarious type of white collar crime will be entertaining! What do you think?